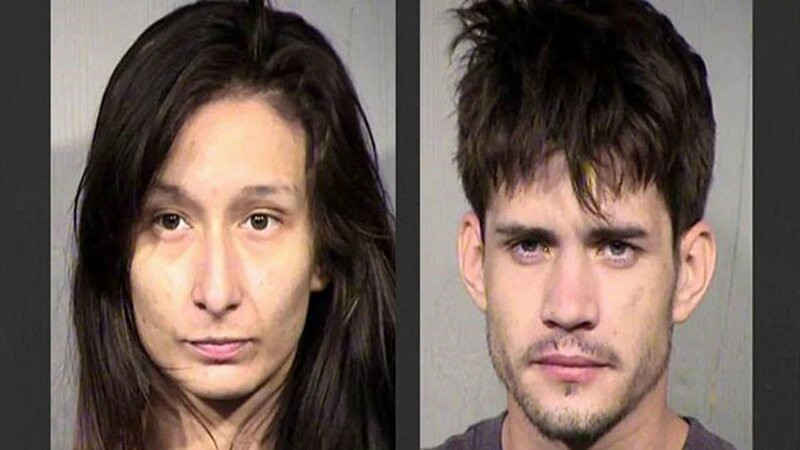 PHOENIX -- A mother and her boyfriend have been arrested after their toddler son ingested fentanyl, methamphetamine, amphetamine, Oxycodone and opiates. The toddler also suffered burns, possibly from a torch used to smoke meth. The child's mom, Estella Hernandez, and her boyfriend, Rafael Kagan, face felony charges of child abuse and possession of narcotic drugs. On August 26, 2018, police officers and firefighters responded to an apartment near Seventh Street and Indian School Road in Phoenix, responding to a call of a child not breathing. Upon arrival, police learned the 19-month-old boy had possibly ingested the drug Percocet while the child's mother, Hernandez, and the mother's boyfriend, Kagan, were sleeping. Officers say they noticed a shelf near the bed containing four white pills and a glass pipe commonly used to smoke meth. Paramedics transported the boy to Phoenix Children's Hospital hospital, where, according to the police report, the "toxicology screening was later found to be positive for opiates and amphetamine." Further testing revealed the child "tested positive for fentanyl, methamphetamine, Oxycodone and opiates." According to the police report, a "nurse stated the child must have ingested a decent quantity of opiates to be as lethargic as he was." Police also noticed the little boy had "bruising to his right eyelid and to his middle back and an abrasion by his lower lip." He also had "red spots under his chin and on his neck." He also had some healed burns on his arm. Police believe burns on the boy's arm were from a torch used with meth. Police say the boy's mother, Hernandez, at first told officers one man was the boy's father and that: "he thinks the child took some Percocet." Hernandez then told police a second story, that another man was the boy's father, and that "he was the one with the pills," according to the police report. She also told police that the second man administered Narcan to the little boy. Finally, Hernandez told police that she and her boyfriend, Kagan, had been sleeping and "she woke up to find the child unresponsive." It was later determined that the couple was passed out. According to the police report, Hernandez told officers that Kagan "deals Percocet pills." And later during a police interview, Hernandez admitted that she, too, sells what she thinks are Percocet pills. She says "she usually puts the pills away after selling them, but last night she did not." She also admits she uses heroin and meth. A search warrant at the apartment revealed an "extensive amount of drugs, drug paraphernalia, money and a scale." CNN Wire & 2018 Cable News Network, Inc., a Time Warner Company. All rights reserved.